VIENNA, Va. - March 24, 2015 - PRLog -- Vienna, Virginia (March 24, 2015). Driving Aids Development Corporation (DADC), the Northern Virginia-based hand control manufacturer, is pleased to announce the publication of “A Mini Roadtrip” in the recent issue of Sports ‘N Spokes magazine, the bimonthly wheelchair sporting publication produced by the Paralyzed Veterans of America. The article focuses on DADC client Mr. Ishmael Lara and his belief that hand controls should do more than get you from point A to point B; they should be as much a part of the car’s performance as they are the functional modification necessary to drive. They should make driving a “performance” car fun, and get you back to doing the things you love. DADC hand controls have been making hands happy since 1982 with their family of hand controls, including the patented, power-assisted Twist and Pull throttles and the manual Twist, Pull, Rock throttles, and Brake Only. Mr. Lara drives a 2013 MINI Cooper JCW Clubman with a DADC Push Rock hand control on board. 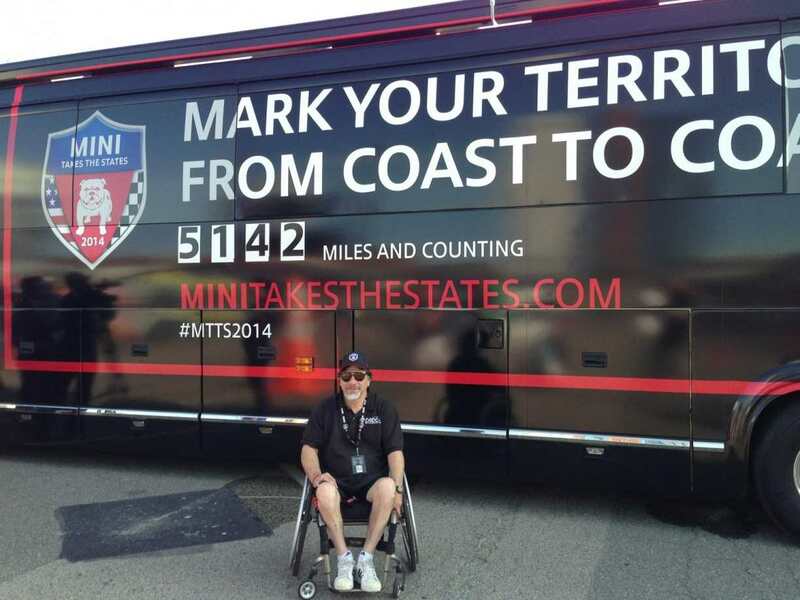 In August, Mr. Lara participated in the MINIs Take the States rally, sponsored by MINI USA. The bi-annual, two-week event is a 5,142 mile odyssey from San Francisco to Boston, through 13 states and 18 cities. When not driving cross country, Mr. Lara participates in the annual MINIs on the Dragon in May and conducts mock zombie hunts with the MINI Cooper Zombie Outbreak Response Team. "The DADC hand control,” said Mr. Lara, “is the most efficient and least fatiguing of any hand control I have used in 17 years. My commute is safer and more enjoyable due to the responsiveness of the accelerator. This DADC hand control puts the "GO!" back in "Stop and Go" traffic." Read the article online at http://pvamag.com/sns/article/6694/a_mini_roadtrip. Family owned and operated, Driving Aids Development Corporation (DADC) helps people with disabilities make the move to independence with safe, reliable, and attractive hand controls. For more information, contact DADC at (888) 762-1046 or www.DrivingAids.com. SPORTS 'N SPOKES is a bimonthly publication produced by the Paralyzed Veterans of America. S'NS reports on competitive sports and recreation for wheelchair users. Since 1975, S'NS has been a leader in wheelchair sports coverage and currently goes to more than 43 countries worldwide. Readers come from all walks of life all having one thing in common: determination! SPORTS 'N SPOKES is committed to providing a voice for the wheelchair sporting and recreation community. For more information, go to http://pvamag.com/sns/.